2 by 3 Heroes: Break it down!! I think I have only ever participated in one group break online with all those breakers you can purchase from via ebay or directly on their sites. Main reason is the price. Yeah, sure, whatever - I don't get all the extra cards, and hopefully I get what I want, but I still think many breakers are overpriced. My opinion - I could be wrong. But when bloggers do group breaks, I try to get in on the ones I find fit my budget and fill needs in the Sox box. Been is a couple over the past months, and it's about time I thank the breakers and share some spoils. First up, Colby from Cardboard Collections did what he called an affordable group break. The price was right, and it almost didn't happen, so I grabbed a 2nd slot to get it filled. Along with my Sox, I picked the Pirates, and my random teams ended up being the Indians and Tigers. A lot of AL Central for me. 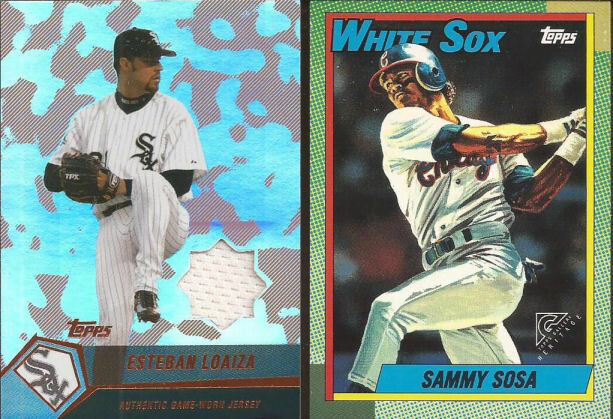 There were three boxes in the break: 2002 Topps Gallery and 2004 Topps Clubhouse Collection. Colby also threw in some bonuses, one being a blaster of Diamond Kings. I think I pulled the whole Sox team set from Gallery, along with that sweet Kendall in a throwback. 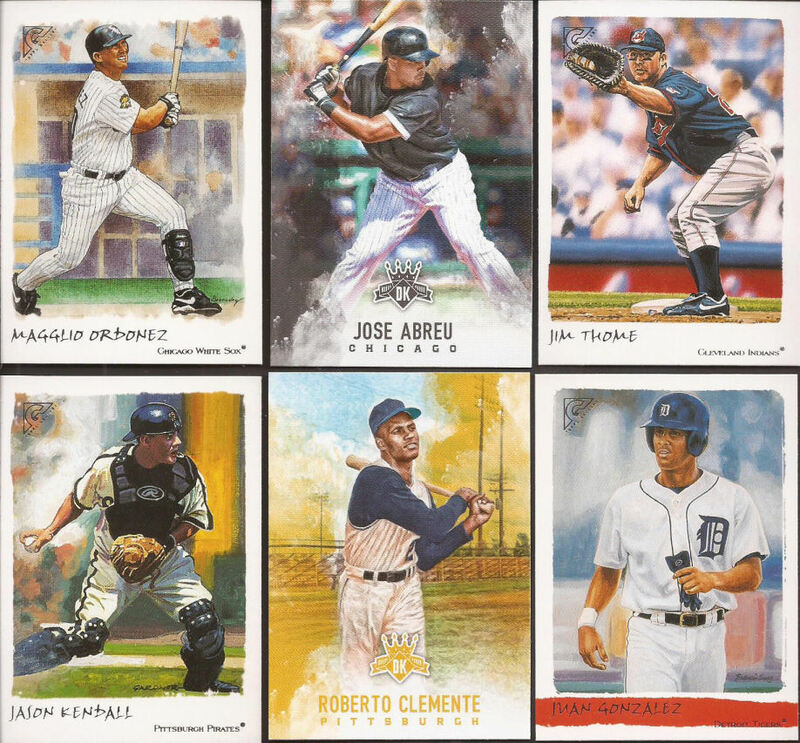 The Clubhouse Collection was a hit per pack product. I grabbed the Pirates since there was a Clemente relic, but nothing from my other teams. Fortunately, if you are going to be shut out of 75% of your teams, when you score twice on your main, it's a joyous thing. I look forward to your next affordable break, Colby. The other recent was run by new daddy Chris at Nacho Grande. Chris called it retro, breaking six total boxes: 02 Fleer Triple Crown, 12 Coopertown, 97 Sports Illustrated, 09 Bowman Chrome, and both a 98 and 12 box of Gold Label. I had my White Sox and the Brewers (blah). Chris threw in some random packs as well, so let's look at the good stuff. These really constitute my only "hits" from the break. 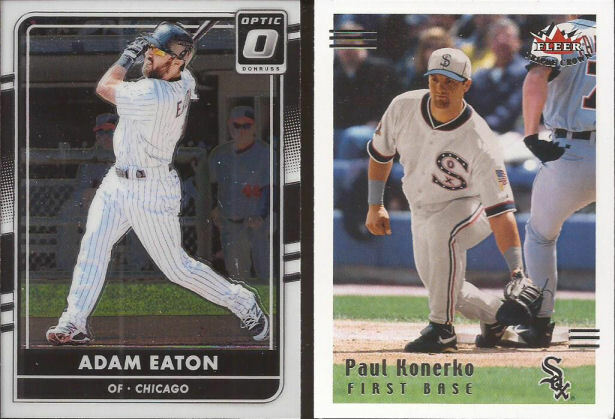 A black foil Moncada, a city variation of Abbott, and a needed Big Hurt, if only a class 1. Not sure when the next time Chris will do another break, being he had to go and be a dad (FOOL!). Seriously - I wish nothing but the absolute best for your whole family. Fatherhood just gets better and better. Unless your baby grows up to be a degenerate. Sweet throwback (?) on the Paulie! Or maybe it's a Memorial Day or July 4th tribute jersey? I don't usually join group breaks... but when I noticed he needed people to fill the break and the Yankees were still around, I jumped on it.